Crusty No Knead Italian Bread is incredible! It’s just like the bread my Italian mother-in-law makes!! 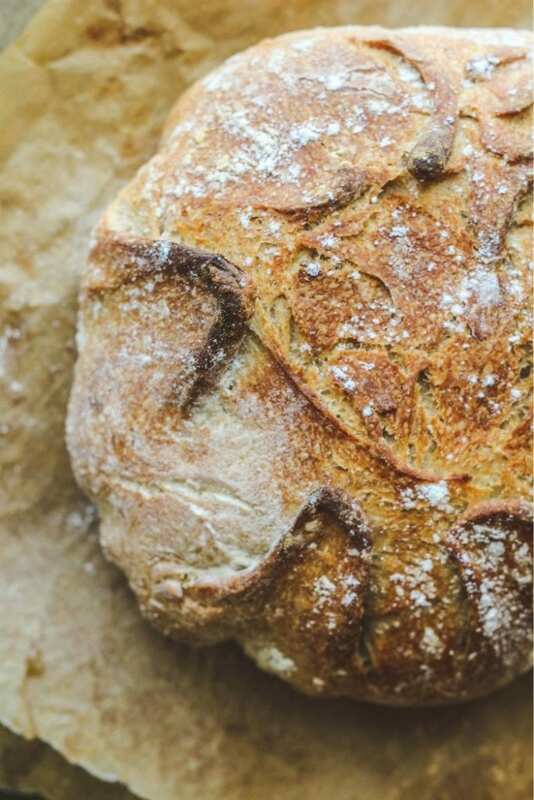 This delicious bread is made in your Dutch oven and is ready in a few hours-no need to have it rise overnight! Perfectly crisp crust and soft on the inside. This bread is fast to make with unbelievable results!! There is a slight problem when you have an Italian mother-in-law that can bake any bread with her eyes closed. You wish you had her skills and her instinct. You wish you had her lifetime of bread education learned from her mother, grandmothers, sisters, neighbors, friends. Whenever I am with my mother-in-law Teresa, I study what she is doing in the kitchen. I take notes. I take photos (she doesn’t like them that much). I sometimes take videos. I am basically stalking her every move and and asking her the same questions I’ve asked her for many years. But she kindly repeats her answers and her lessons. There is her Calabrian bread that is out of this world. It is a bread she and her mother and sisters all make. Her brother’s wives also make this same bread. They are all scattered all over Italy baking this same bread every week. Yes, they bake it every week. I obviously don’t have a neighborhood brick oven to share and I also don’t have 12 people eating at my house on any given nights. So one small loaf is all I need. One small perfect loaf like this loaf. I’m not saying this loaf is identical to Teresa’s Calabrian crusty bread, but it is definitely very close! My husband approves and that says a lot!! You can see some photos here of the crusty Calabrian bread Teresa made the last time she was staying with us. Look at that crust on this bread!! 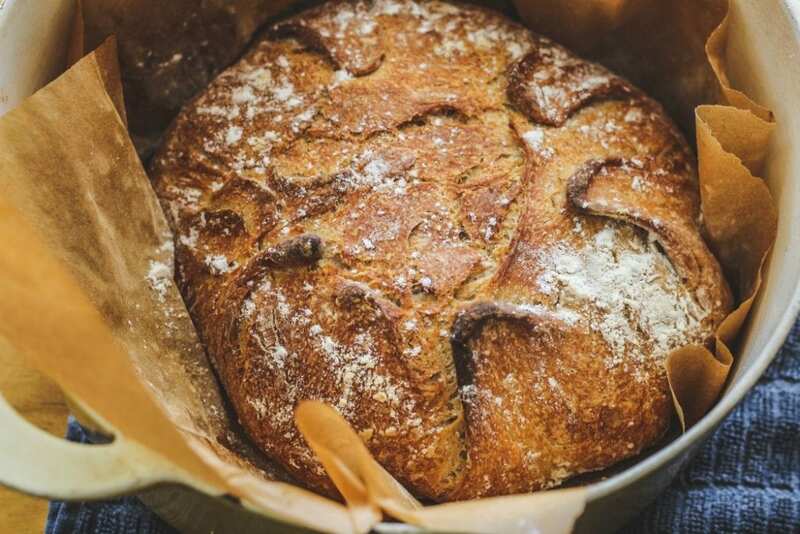 You can make a bread this fabulous! It just takes some patience and some time. Twelve Loaves: I used to do a monthly bread baking challenge called Twelve Loaves. It was launched back in May, 2012 (so much time has flown by!). It was filled with wonderful bakers from all over the world and we would bake along to a different theme. The baking group always inspired me to bake bread. This is a personal bread baking challenge to myself! In order to get back to baking bread regularly, I am doing #TwelveLoaves again. My goal is to bake Twelve Loaves by the end of 2019. This is my 2nd bread recipe of the year. My amazing Chocolate Babka-Babka al Cioccolato was the first bread. This photo below is of a bread I made this week. The other photos were of the bread two weeks ago. Each time I make it and pull the ends together it gives the bread a different shape. Also, if you don’t use a bread proofing bowl, the flour will leave a different design in the folds each time (like mine!). For this bread I used 5 qt, but you could even use a 3 quart Dutch or French oven (Le Creuset calls them French Oven). Flour quantities may vary. I start out with 2 1/2 cups of flour and I add the last 1/2 cup and sometimes a little bit more. You may even need less flour. There are variables that affect the dough, such as humidity and also the temperature. If it’s a cold and rainy day, your flour amount will differ from a hot and sunny day. If you feel your dough is too sticky, add a little bit more flour at a time. Rising time could also differ from kitchen to kitchen. If you have a hotter environment like we do here in Florida, it will rise much quicker. 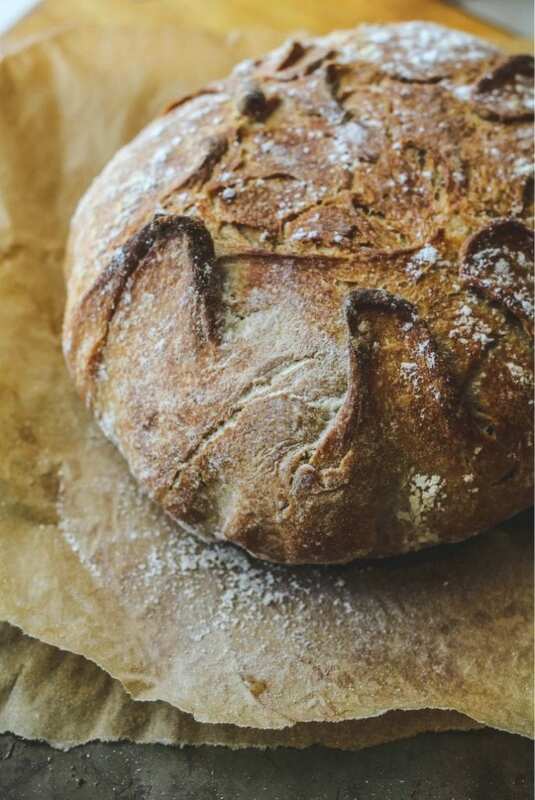 This bread goes perfectly with any great Italian cheese or salami and olives. It’s wonderful to dip in your favorite soup. It’s also the perfect bread to do la scarpetta, that’s Italian for cleaning your plate with a piece of bread; especially a good sauce. Yes, Italians do eat bread with their pasta! 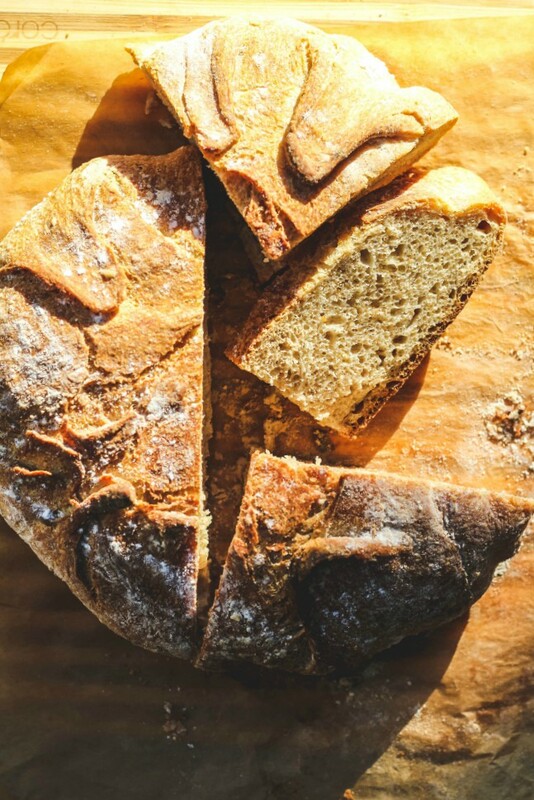 Another fantastic recipe is the overnight version of this crusty bread. 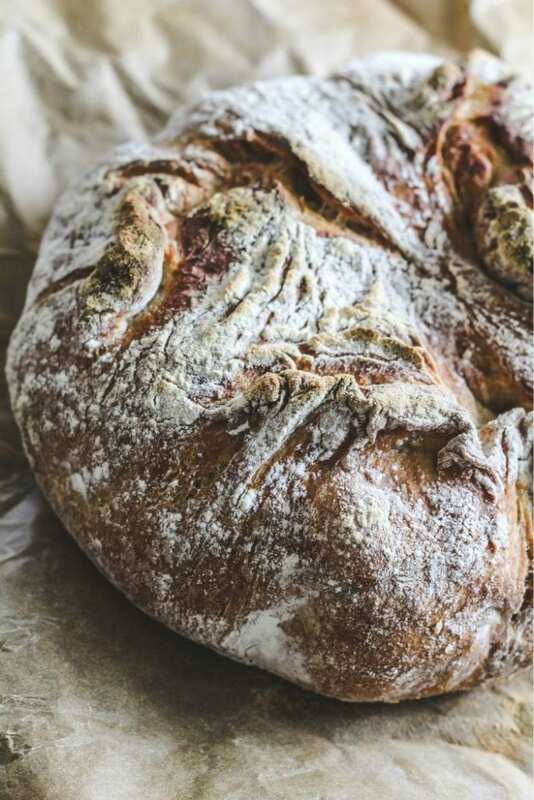 This easy homemade crusty Italian bread recipe is incredible! It's just like the bread my Italian mother-in-law makes!! 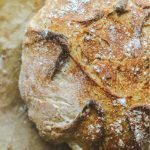 This delicious bread is made in your Dutch oven and is ready in a few hours-no need to have it rise overnight! Perfectly crisp crust and soft on the inside. In the bowl of a stand mixer with dough hook attached, dissolve the yeast in the warm water with the sugar and let it proof (5-10 minutes until foamy). In a small bowl, add the flours and salt. Give it a few whisks to combine together. Add the flour to the bowl a small portion at a time and mix on low speed. Once you have added all the flour increase the speed and mix until the dough starts to pull away from the sides of the bowl. If you notice the dough is too sticky, add about a tablespoon more of dough at a time until you get a dough that is not too sticky to handle. (If you’re mixing by hand, mix until ingredients have just come together and form a smooth dough). When dough is ready, turn mixer off and remove the the dough hook. Grease a large bowl. Place the dough in the bowl. Cover with plastic wrap and place in a warm spot until doubled in size, about 1 1/2 hours (the goal is to not have the dough be too springy). Sprinkle a little flour on a clean counter. Carefully remove the dough without disturbing it too much onto the counter. Pull the corners together to form a round bowl and place the dough back into the same bowl (sprinkle a little flour into the bowl) seam side down. Cover with a tea towel and let it rise while the oven heats up. Preheat oven to 460 F with rack in lower third of oven. Heat a covered 3 1/2 quart heavy ovenproof Dutch oven (9 inches in diameter) with the lid on for 30 minutes or until dough is ready. Place a sheet of parchment paper on your counter (about the length of a baking sheet). Sprinkle on a little flour. Place your loaf seam side up on on the parchment paper. Carefully remove preheated pot from oven, and uncover. Remove the towel from top of bowl and quickly but carefully lift the dough using the corners of the parchment paper and place the dough into pot, seam side up (the dough is on the parchment paper). Sprinkle a little more flour on top if it has been absorbed while rising. Uncover pot, and bake until bread is dark brown, 15-20 minutes. Carefully lift bread using the parchment paper from pot and transfer to a wire rack to cool completely. Be sure to let cool completely before slicing.